Something tells me Vancouver, BC has a healthy Blues scene! Here's James Rogers covering Freddie King's "Big Legged Woman" with great chops and vocals. I hear some Albert King bends and a little Albert Collins in there too. So basically, Rogers has the right keys in his pocket-- and he's a Strat man too! 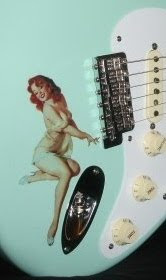 James also winds his own brand of Rogers Pickups, and provides full guitar tech services as well as Blues guitar lessons at his Mission, BC location. Pickup winders, techs and gear makers are not always good guitar players-- even players at all. So, it's always a nice bonus when your tech or pickup maker has the ears and feel of a good guitarist/vocalist. www.youtube.com/user/allguitarscnc - Lots of videos!